From April 15 to October 31, the Dallas Arboretum and Botanical Garden unveils “Celebrate the Children,” an art exhibition designed and created by Gary Lee Price. Guests can interact with beautiful, hand-crafted bronze sculptures of children, which are displayed throughout the garden. 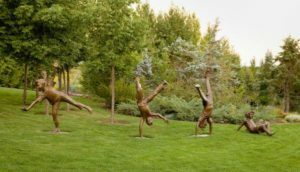 Created by Price, “Celebrate the Children” features more than 25 different, hand-produced, bronze sculptures, many of which are of his own children. “Celebrate the Children” exhibition is part of Summer at the Arboretum during which the garden hosts special Family Fun Fridays in June, July and August where families can enjoy the gardens, along with special activities such as face painting and a petting zoo. For more information, visit dallasarboretum.org.